In 1680, the Society of Friends, better known as the Quakers, set up a scheme in London in which stocks of flax were purchased for supplying the Quaker poor to spin-up at home or in prison. This project had as its treasurer John Bellers who later developed plans for a 'College of Industry' — a co-operative, self-sufficient, humanitarian community where up to two hundred labourers and a hundred of the impotent poor would live and work together. Although Bellers' utopian plans were never implemented, their influence can be seen in two subsequent establishments set up by the Quakers. 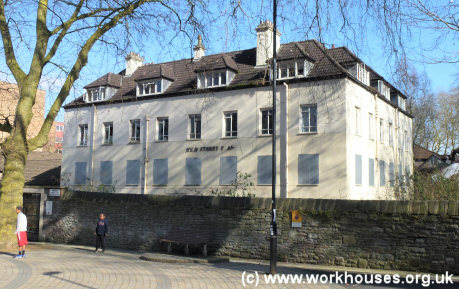 The first was a workhouse at Bristol, founded in 1696. The second, opened in 1702 at Clerkenwell in London, is described elsewhere. The Bristol scheme was originally intended for providing employment for seven poor Quaker weavers and the instruction of children. It was so successful that in 1700 that new premises were erected in New Street, St Jude's, at a cost of £1,300 "for willing Friends to work in and the aged and feeble to live in." The premises incorporated an orphanage, a school, and an almshouse, which housed a total of 45, including 24 paupers and 10 apprentices. The inmates were mainly employed in the manufacture of worsted cloths known as cantaloons. Workhouse residents dined according a schedule of diet that repeated every two weeks. Old people in the workhouse received pocket money of two shillings a week plus a tobacco allowance. Bristol Quaker workhouse site, 1884. A survey of Bristol in 1861 recorded that the site was still "used as an asylum for poor Friends." In 1867, the building was extended at the south-east and the courtyard was roofed over to create a hall. Part of the site was also used as an infants' and boys' school and part housed the New Street Mission. In 1929, Quaker ownership of the site ended when it was sold to the Bristol Churches Tenements Association for conversion to workmen's flats. The building was taken over by Bristol City Council in 1961 and became known as New Street Flats. In 2013, the building — standing empty and boarded up — was sold to a property company for refurbishment as modern apartments. Former Bristol Quaker workhouse, 2013. In 1958, a new Quaker meeting house was erected on the site of the adjacent burial ground. Essex Record Office, Wharf Road Chelmsford CM2 6YT. Holdings include original of Richard Hutton's Complaints Book (1711-37). Lloyd, Arnold (1950) Quaker Social History 1669-1738.